The most valuable aspect of religion, writes Robert Lawrence Smith, is that it provides us with a framework for living. 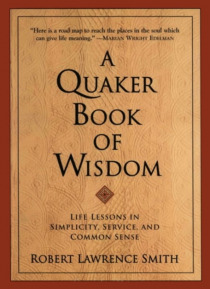 I have always felt that the beauty and power of Quakerism is that it exhorts us to live more simply, more truthfully, more charitably.Taking his inspiration from the teaching of the first Quaker, George Fox, and from his own nine generations of Quaker forebears, Smith speaks to a… ll of us who are seeking a way to make our lives simpler, more meaningful, and more useful. Beginning with the Quaker belief that There is that of God in every person, Smith explores the ways in which we can harness the inner light of God that dwells in each of us to guide the personal choices and challenges we face every day. How to live and speak truthfully. How to listen for, trust, and act on our conscience. How to make our work an expression of the best that is in us.Using vivid examples from his own life, Smith writes eloquently of Quaker Meeting, his decision to fight in World War II, and later to oppose the Vietnam War. From his work as an educator and headmaster to his role as a husband and father, Smith quietly convinces that the lofty ideals of Quakerism offer all of us practical tools for leading a more meaningful life. His book culminates with a moving letter to his grandchildren which imparts ten lessons for letting your life speak.